The 442nd Infantry Regiment was formed in 1943, and in a little more than two years became the most decorated unit in US history. During World War II, about 14,000 men served in the regiment and earned 9,486 Purple Hearts, 21 Medals of Honor, and numerous other medals and citations. Yet the 442nd was only formed after two years of struggle, because the US military didn’t want soldiers of Japanese ancestry in their ranks. In the months following the Japanese attack on Pearl Harbor in December 1941, more than 110,000 Japanese-Americans from the West Coast and Arizona were interned under Executive Order 9066; about two-thirds were U.S. citizens. Americans of Japanese ancestry were also reclassified as “enemy aliens” and were no longer allowed to join the military. 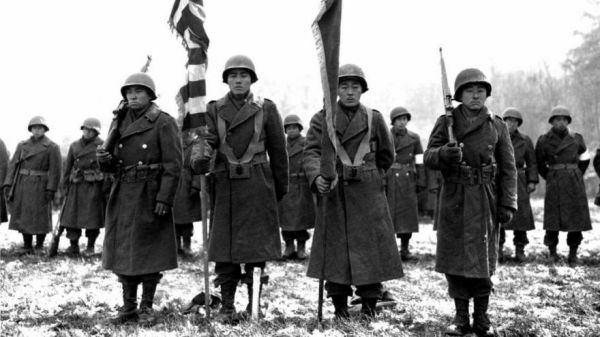 Despite the fact that Japanese-Americans had served in the military for decades, many already-enlisted troops were discharged from service. The government even seized items like cameras or radios from Japanese-Americans, in case they might use them to spy. The ousted troops and other young Nisei men wanted to help the war effort, and started from the bottom to work their way up into military service. Mental Floss has the story of how they did that, and the historic feats of bravery the 442nd performed in Europe once they were allowed to fight.